Hello everyone. I am back from my much needed 5 days on a beach vacation! The beaches in Ubatuba are amazing and each one is more beautiful than the next. I will share some photos soon. Today I want so share a card I made for the 100th sketch challenge on Can You Case It!? Congrats to Eva and her whole team. 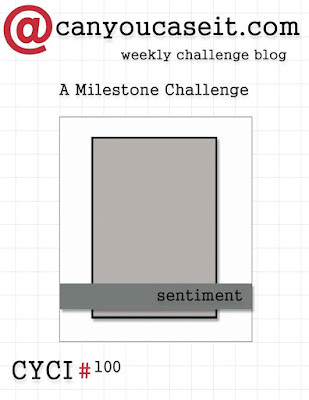 I think today's card is just perfect to help them celebrate their milestone post! I started with a top-folding A2 white card base. To the card front I adhered a piece of black cardstock that has embossed dots on it. I found it in my stash. To this I adhered another piece of cardstock - silver with white circles. I die cut the 2nd largest rectangle from the Stitched Rectangles Stax by My Favorite Things with white cardstock. Next, I embossed the image of the champagne glasses from the Clink set by Your Next Stamp with silver embossing powder - on the piece of white cardstock I just cut. I then filled the inside of the glasses with Glossy Accents and colored in the ribbons and the sparklers with a Silver Wink of Stella Brush Pen. After the Glossy Accents dried, I adhered the cardstock to a piece of black cardstock, which I then adhered to the card front. Then I die cut, 3 times, the Fancy Cheers Die by Your Next Stamp, glued them together, and adhered it card front under the glasses. I applied Glossy Accents to the word to give it shine. Lastly, I adhered a crystal to each of the corners on the white cardstock. Done! This would be a great card for any occasion, a wedding, an engagement, an achievement - or a New Year's card. Well, I hope you enjoyed this card. A very very happy, healthy, and art filled New Year to all of you. Where ever you are on the globe, stay safe and I will see you next year! Hello everyone! I cannot believe that tomorrow is Christmas Eve...and my birthday. Trust me, it's not fun to have a birthday on Christmas Eve!!! We are a heading a few hours up the coast to Ubatuba, a beach town here in Sao Paulo. 5 days of beach! Won't have much Internet but I have scheduled a card or two and will try to post some photos. Today is a quick fun square card - again with my favorite snowmen. 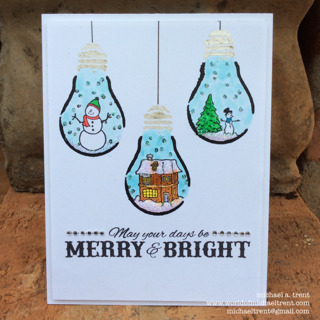 I actually used the same two sets as yesterday - Snow Way and Insta-Cute, both by Susan K. Weckesser for Unity Stamp Co. I started by stamping the large Polaroid image from the Insta-Cute set on white cardstock with black ink. Then I stamped just the diamond pattern on the bottom using Warm Red Chalk Ink by Colorbox. I also cut them both out. Then I masked off the 4 sides - where the photo would be - with sticky notes and applied some Tumbled Glass Distress Ink to give a hint of a blue sky. Then I stamped the trees from White Christmas set by Stampin Up with Vintage Photo Distress Ink. After this I stamped one of the snowmen, had my Scan N Cut cut him out. Then I colored him in and glued him between the trees. I adhered the Polaroid piece to a piece of black cardstock, which I then adhered to my card base - a top folding piece of red cardstock, 4.5" x 9". Lastly I applied some pop dots under the diamond pattern and adhered this to the card front and applied some Red and Crystal Stickles to the card front. Done! Don't forget to stop by Susan's blog for her Christmas Love Campaign. 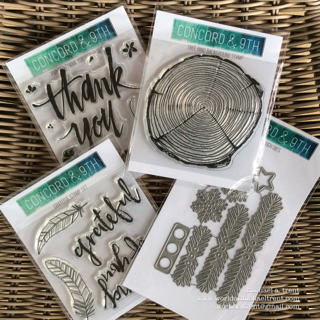 Canadian Scrapbooker Magazine is a sponsor and you can win a year's subscription just for entering a project. Labels: #christmaslovecampaign, #craftuplove, Christmas Card, Susan K. Weckesser, Unity Stamp Co.
Today I have another cute card using my favorite new snowmen set - Snow Way by Susan K. Weckesser for Unity Stamp Co. Susan has an awesome Christmas Love Campaign that you should check out. Canadian Scrapbook Magazine is one of her sponsors and they are having a contest....go check it out. 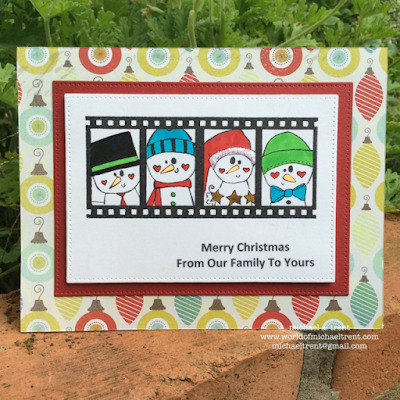 I wanted to make a "from our family to yours" type of card and was looking through my stash when I found another set, also by Susan called Insta-Cute. One of the images in the kit is a film strip and I just pictured each of the snowmen in the frames....and it all came together after that. I think it's a really cute card and I hope you agree too! Since I do not have a stamp with the phrase I wanted, I typed it up on the computer and printed a few sheets out. I knew I was going to use the 2nd largest rectangle from the Stitched Rectangle Stax by My Favorite Things, so I did make sure there would be enough space between each phrase to get at least 3 cuts. I placed the filmstrip stamp down on the cardstock and then placed the die down to make sure I got it all centered the way I wanted. Then I secured the die with a piece of tape and cut them out. I also used the largest Stitched Rectangle die from the same set and cut a bunch of pieces of red cardstock. Then I stamped the filmstrip above the phrase using a stamp positioner and Onyx Black Versafine ink. Then I stamped each of the 4 snowmen, 1 in each of the frames. I started by masking off the first frame with sticky notes and then stamping the image in the frame, also using a stamp positioner. I did this with each of the snowmen and each of the frames. This is what it will look like when all 4 snowmen have been stamped. Come on...they are adorable...no? After this I colored in all the images. I cut a piece of white fun foam and adhered it to the back of the white cardstock, which I then adhered to the red cardstock, which I then adhered to my A2 top folding card base. I used these guys this past Saturday also and, I am happy to report, they will be in my blog post tomorrow too. I promise after that to stop until next year. LOL. To make this card I started with a top-folding A2 card base of textured white cardstock, another piece of the same cardstock, 4" x 5.25", and a piece of white fun foam also 4" x 5.25", which I adhered to the piece of white cardstock. Then I die cut the Ring Frame out of red textured cardstock, which I adhered to the front of the white cardstock using my Zig Two Way Glue. (If you get any glue residue on the front you can remove it with a Xyron Adhesive Eraser). Then I stamped the phrase, that I found on an older Hero Arts set called Holiday Messages (CL244), with Onyx Black Versafine ink. Next up I grabbed my jar of buttons and went through it finding different shapes, sizes, textures and played around with them until I found the right amount that would fit into each of the round spaces. I also grabbed my glossy accents and a roll of red/white baker's twine. Then I glued each button down with Glossy Accents. Once dry, I poked my needle through the holes and then, with one long piece of the baker's twice, I stitched through all the buttons. Then I adhered this piece to the card front and applied some green, gold and red sequins to the card front. Done! Here is a shot of the same card before I put the sequins on the front. I like both of them. Which do you like better? And since I got more happy mail today with some Unity Stamps inside, I decided to use Whispy Prairie for the card sketch. I started with the following - (1) a side-folding A2 Kraft card base, (2) a piece of designer scrap paper that I cut with the large stitched rectangle die from "Bundle of Stitched Shapes" by Simon Says Stamp, (3) a piece of black fun foam 4" x 5.25", (4) white cardstock that I cut using the 4th largest die from A2 Matting Basics A Card Creator by Spellbinders, (5) a piece of Kraft cardstock using the horizontal stitched strip from Blueprints 1 by My Favorite Things. I distressed the edges of the card front and the designer paper with Vintage Photo Distress Ink by Ranger. Then I adhered the stitched rectangle piece of designer paper to the black fun foam, which I then adhered to the card front. 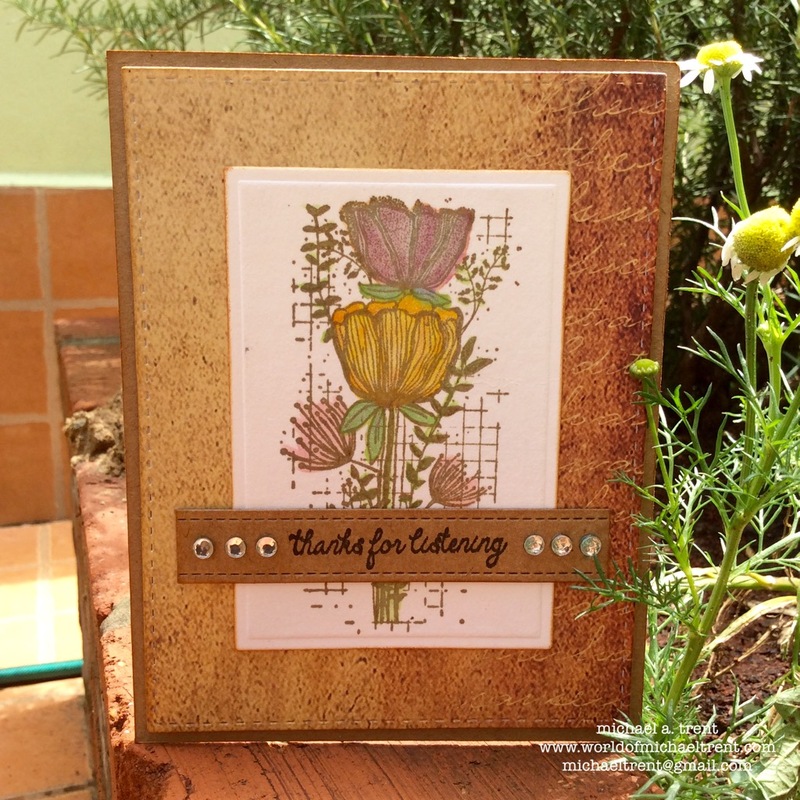 Then I stamped the flowers using Vintage Sepia Versafine ink on to the white cardstock. Allowed it to dry and then colored it in a bit using a water brush and some Mini Distress Inks from Ranger (Spun Sugar, Mowed Lawn, Spiced Marmalade, Mustard Seed, & Seedless Preserves). After they dried I went over them with a Clear Wink of Stella Brush Pen to give some shimmer. I distressed the edges of the white cardstock with Vintage Photo again and adhered it to the card front. Lastly I stamped one of the phrases that came with the set - "thanks for listening" - to the piece of Kraft stitched cardstock that I cut earlier and which I trimmed to 3.5"
and adhered it over the flowers in the lower section and added a few crystals on each side. Done! Hmmm...it is a bit masculine but I do like it. I hope you guys do too. 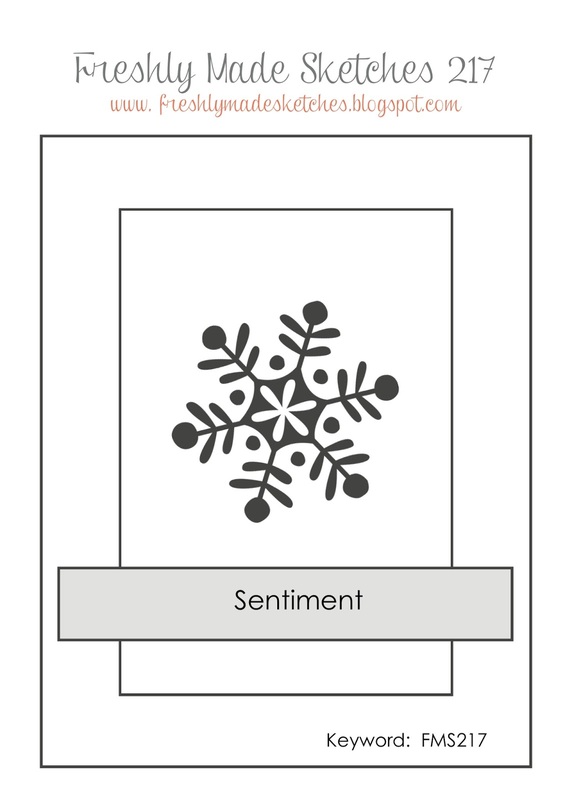 Labels: Card, Card Challenge, Freshly Made Sketches, Unity Stamp Co. Snow Way! A Happy Snowman Family! Hello everyone! The weekend is here and I am finally over this cold!! This morning was supposed to be my last Portuguese class until next year but it seems they changed their minds because when I got to the school, it was closed. LOL. Well, now I can head to the green market to get some stuff for a small BBQ we are having today. One of Ruy's sisters is in town with her daughter and we will get to see them. Gosh..she has no idea I am even posting this and I hope she is not crying at this point...sorry Susan. LOL. Anyway...she has a line of stamps with Unity Stamp Co. and I have always loved her images. They are so whimsical, free, fun. She has a set of 4 different houses that I bought last year that scream "Cat In The Hat" or Dr. Seuss. Of course I bought them for a project in my head but, as usual, that project is still up there waiting to get out. When I saw her new snowmen set called Snow Way, I knew they would be perfect to use with one of the houses - The Happy Homestead. 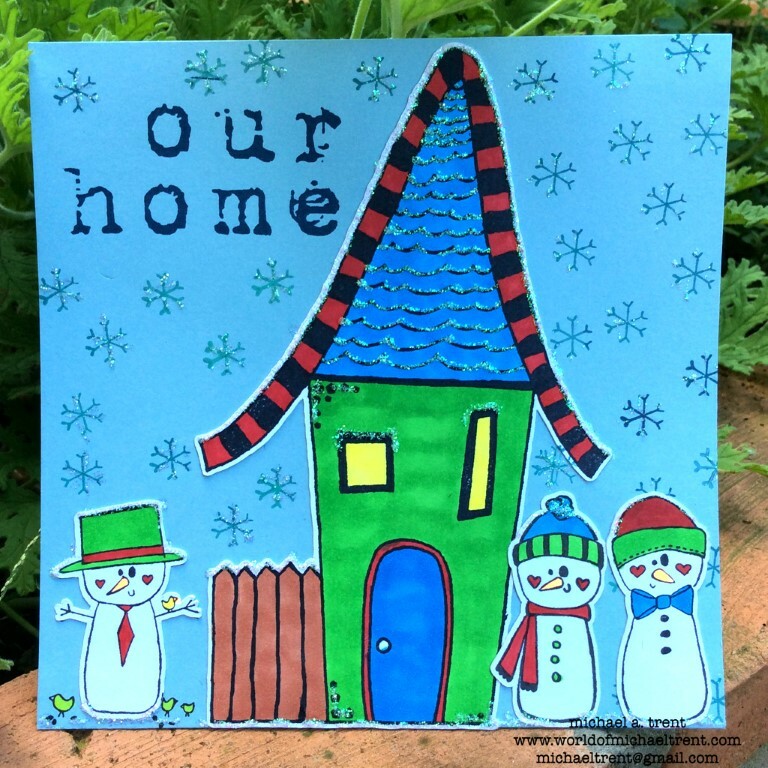 The first thing I did was to stamp the house from The Happy Homestead set and some of the snowmen from the Snow Way set - on white cardstock - and had my Scan n Cut (SNC) cut them out. The I started with a piece of 6" x 6" light blue paper. I wanted the color of the sky without having to pull out any inks. And I stamped one of the snowmen in the lower left corner. I knew that the SNC would not cut out the birds but I could glue over the image. Then I adhered the snowman with the bird on his arm over the stamped image, the house next to him, then the other two snowmen. 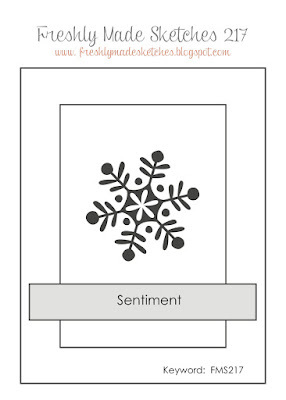 Then I stamped the snowflake (also from the Snow Way set) using Pool to Navy Ombre Ink by Hero Arts. I left space in the upper left corner for the two words I wanted to use. Then I stamped the word "our" and "home" from the Le-Mason and Little Haven sets using Cobalt Archival Ink by Ranger. I did put a sticky note over the apostrophe and s in the word "ours" to get just the word "our". I also grabbed my Crystal Stickles and applied it over the snowflakes, the roof, the tops of the hats, the top of the fence, and along the bottom. The one thing that I have found out Susan from her postings is her absolute love for her family and vice-a-versa. This family is so close, which is so rare these days. And, if these snowmen were her family, I think this is what their photo would look like up on their wall. LOL. Now I just need to get her address to shoot it off to her! Snow Way - Unity Stamp Co. The Happy Homestead - Unity Stamp Co.
Le-Mason (for the word Our) - Unity Stamp Co.
Little Haven (for the word Home) - Unity Stamp Co.
Labels: #christmaslovecampaign, #craftuplove, Christmas Love Campaign, Susan K. Weckesser, Unity Stamp Co.
Hello everyone. Today I have a really cute card using a stencil and some rubber stamps. Last time I was in the states I went to a rubber stamp show and bought a bunch of little Christmas Village stamps from DRS Designs to make a winter scene. I already had this project forming in my head - I saw the light bulb stencil by Carolyn Dube from the April 2014 StencilGirl StencilClub Kit in my head....I saw these little images forming into a Christmas scene in my head....but it took several months to get this project out of my head! To make this card I started by cutting a piece of white cardstock 4" x 5.25". Then I masked off the top and center of the light bulb with post it notes, placed the stencil down on the paper and, using a dauber and some black paint, colored in the outline of the light bulb. I did this 3 times at different heights. Next up I masked off the area below the screw part of the bulb, placed it back over each of the bulbs I did in black and using a dauber and silver paint, colored in the screw top section of each bulb. Then I drew a line from the top of the cardstock to the bulb with a black micron pen. Now the fun begins - building each scene in the light bulbs. I used a stamp positioner for all of the scenes because I wanted to make sure they would not be outside the bulb. After I stamped the scenes I stamped the phrase (by Momenta) under the 3 bulbs. Then I colored all the scenes with Tombow markers and applied some Crystal Stickles to each of the snowflakes, around the bases of each of the images, and on the house roof. Finally, I cut a piece of white fun foam 4" x 5.25", adhered it to the back of the cardstock with the light bulbs and then adhered this piece to the card front. I wanted this white on white look and the fun foam takes the place of using foam squares or dots. The last thing I did was to glue small crystals to the phrase. Done!! Hello everyone. It's Thursday!! One more week and I am off to a beach for 5 days. I have not had a vaca in many years and am looking forward to chilling on the sand. With my stencils and trying to get my StenDoodle mojo back!! Even though I have been fighting a cold for two days now I seem to have had more energy with the cold!. Go figure. a die and some stamps that I ordered from Concord & 9th. Check out that Tree Ring!!!! This is a relatively new company that has been getting a lot of buzz....especially on Instagram...and for good reason. Their images rock! They are unique, fun, fresh, and are NOT just copies of what every other company is doing. The stamps are really well made and I highly suggest you check them out!! OMG...the Tree Ring I use today and their New Releases....I don't know which I like better. 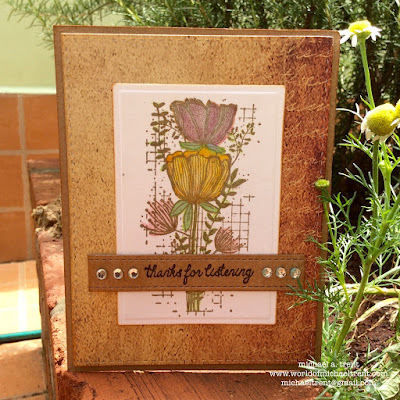 Today's card is for the SIP (Stamp Ink Paper) Challenge No. 27. 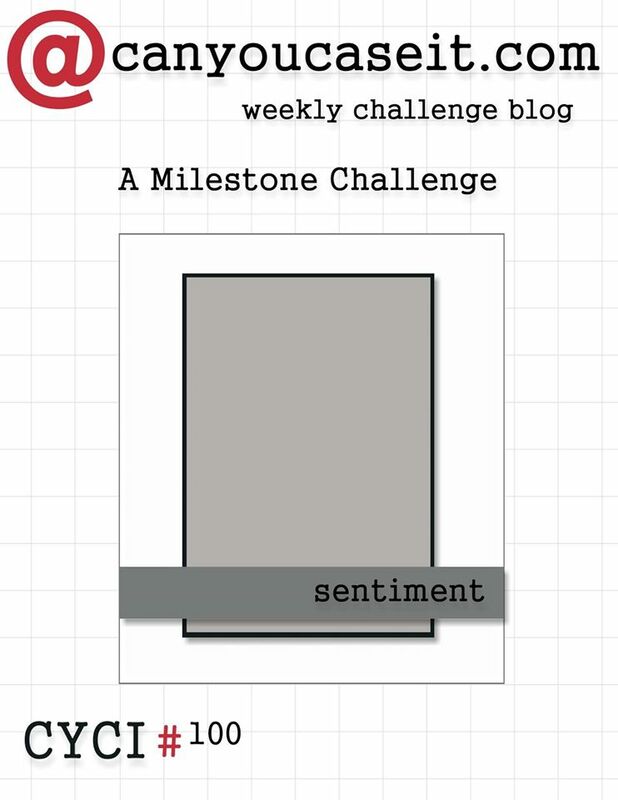 The theme is "Thanks" and two of the stamps I got would work perfect for this challenge. My card size is 5.5" square so I start with a top folding card base of white cardstock, 5.5" x 11", scored at 5.5". To this I adhered a piece of 5.5" x 5.5" scrapbook paper with a blue pattern on it. I wanted some dimension to the card but did not want to use foam dots. So I cut a piece of blue fun foam, 4.75" square, and adhered it with double sided tape to a piece of blue textured cardstock, also 4.75" square. (I learned this trick from Jennifer McGuire and it really is so much better than using pop dots.) Then I adhered this to the card front. Then I cut a piece of kraft cardstock, 4.5" x 4.5", and stamped the Tree Ring stamp in the center with Vintage Photo Distress Ink. 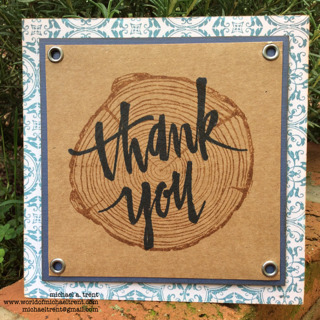 Now...because I wanted to stamp the "thank you" over the Tree Ring image and I wanted it to really stand out and show, I pulled out my Misti, placed the kraft cardstock down and then stamped the Painted Thank You image 3 times with Cobalt Archival Ink. Then I added a platinum eyelet in each corner and adhered this piece to the center of the dark blue cardstock. Done! I hope you enjoyed this post and card. And I really hope you enter one of your cards into the challenge. This challenge is open for two weeks to give people more time to enter because of the Christmas holiday. Click HERE to be taken to the challenge page. Card base - white cardstock 5.5" x 11"
Dark Blue Textured Cardstock 4.75" x 4.75"
Dark Blue or Black fun foam 4.75" x 4.75"
Kraft cardstock 4.5" x 4.5"
Hello everyone!! I love Pinterest. I admit that I can spend hours on this site finding inspiration with all the amazing talent in the world! Sometimes something on a card or project gets the gears in my head moving. This was one of those times. It was made by a woman named Lynn Mangan and you can click HERE to see her original blog post from 2011. And, since my mind works in strange ways, I focused on the wreath/circle stamps because I remembered that I have a stamp set by The Scrapbook Diaries that would work. This card really started because of the above card and a circle stamp. After almost 25 years of stamping I have a mountain of images I have bought but never used. I've had some fun lately digging into that vault and pulling out some great stamps! 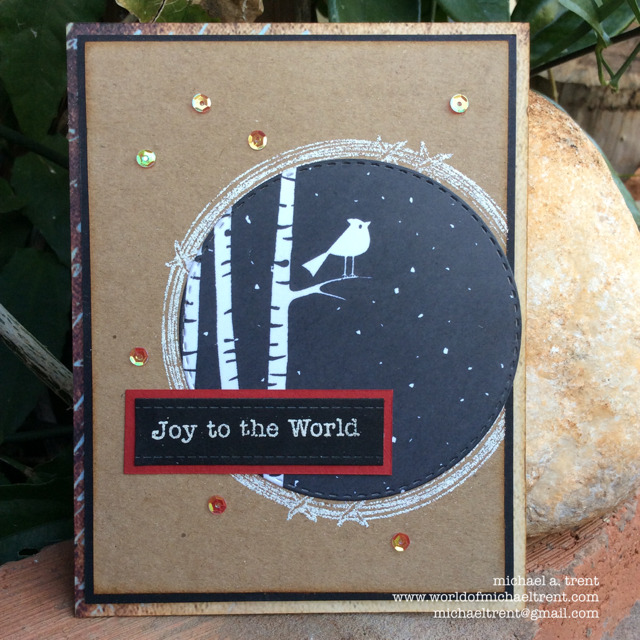 Today I am using a Hero Arts set called Merriest Christmas Wishes. They don't make it anymore but you can still find it online and Ebay. First I cut my papers - an A2 card base of white cardstock to which I adhered a piece of designer paper, a piece of black cardstock 4" x 5.25", and a piece of Kraft cardstock 3 7/8" x 5 1/8". Because I wanted this image to be really black, I pulled out my Misti and stamped the image 3 times with Onyx Black Versafine ink. Then I placed the 3rd largest die from the Stitched Circle Layers set over the image, secured it with tape, and ran it through my Big Shot. Look how beautiful this black is after using Versafine and the Misti! Next I took the piece of Kraft cardstock and stamped the largest of the stitched circles from the Beauty & Grunge set by The Scrapbook Diaries (the image this whole card was formed around) - with Versamark ink and white embossing powder. Then I adhered the Kraft cardstock to the black cardstock, which I then adhered to the card front. Then I adhered the stitched circle to the center of the white embossed image. Then I stamped the phrase "Joy To The World" from the same set, with Versamark ink and white embossing powder. Heat set. Then cut and layered it on a piece of red cardstock and applied some gold/red sequins around the card front. Done!! Stamp Ink Paper (SIP) Challenge No. 25 - Sparkle!